Ms. Kelly Olexa and I hosted a kick off party for the holiday weekend and we had a blast. 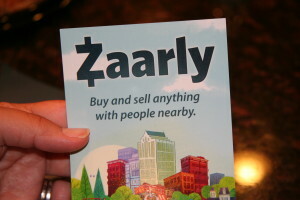 Zaarly was a pretty fun service to play with as people helped us pull together our idea in just days! Food, bartender, and party ware was taken care of with a few keystrokes. 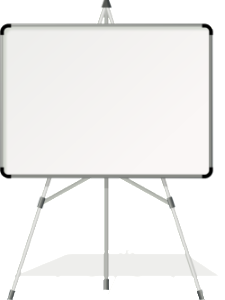 We will do a more detailed review soon but wanted to get the party clips up first so you could start thinking of the possibilities of where Zaarly would be helpful in your area. Kelly picked out her dream of Zaarly-ing boys to come wash her car… yes it’s all in the video. 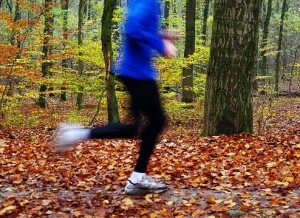 Have you downloaded your free RockMyRun.com mix yet – I am in Love. I want them to personally DJ all my run and talk to me specifically during my weakest miles 😉 I feel like it’s been a little party in my ears when I am running. Rock N Roll Chicago training is officially starting for August. I have to get my short runs up to 5 miles to try for a different result at the finish line and I am doing fairly good thanks to some help. I have been kicking up my mileage with friends. I LOVE running with PEOPLE!! 😉 It is so much easier to keep your mind on something other than the mind games of running and talking to girls while I run is really helping my cardio! Good for the lungs, legs, and soul – find a friend!! LOL! I was going to show a video of my push up progress. Didn’t think of the fact the 8 year old didn’t know how to use the video camera. Ooops. More to follow. Also will be posting some happening video of a Zaarly party that is kicking off the holiday weekend!! Kelly and I will be tweeting from the Zaarly party tomorrow with awesome pics and your chance to DJ our party from afar — so if you are around – tune in and join us!! 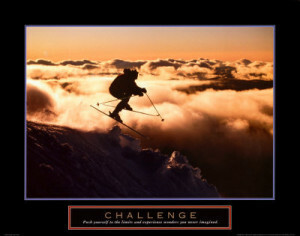 Seems both physical and mental challenges have been popping up on my radar screen lately. I have been working on the push up/pull up/squat circuit still and am moving this week up to 8 sets of each. I can really notice the difference in my cardio ability from changing it up. Just when I was starting to feel a little comfortable, the Combine360 challenge pops up from a trainer at our local XSport. The guys and the girls do the same challenge on camera and get scored based on their time and doing the circuit correctly. My husband did it on Saturday and now is egging me on to try it this weekend. OYE! Of course he is saying that b/c he had not tried it before and killed it with a 4 minute time and was able to place among the men. Check out his video. I am proud of him! Mike, the Under Armour trainer at the gym, is has dangled the carrot of winning Under Armour clothing as my incentive to get out there and try it…. what do you think? 10 minutes of a near death experience for a workout outfit. OK maybe a little dramatic but the butterflies in my stomach are just what I remember when I tried my first half marathon. I have the TRX up in the basement now so I did try to the very end of 25 rows and I see that as being the hard part being at the end AND when you are dead tired. I started my running this week. And I would be going right now if it would stop raining in the Chicago area. The other part of the BIG challenge for this week is to get my mileage WAY up. I want to get comfortable doing the 5 mile distance. I found some girlfriends to help hold me accountable and drag me out there. Today marks less than 9 weeks until the next half marathon so I need to do something different to get a new result. One thing I have ALWAYS been bad at is following the schedule and getting my weekly mileage not to fall below 15. All these challenges kicking off this week! I love the adrenaline of a new challenge but man this not knowing how I am going to do… I could do without that Wish me luck stepping up to the plate this week! This time of year always increases the amount of press I see on tv and magazines about the dangers of the sun. Most of these messages hit our fear of disease and cancer. I think some times the sun needs a PR department to say that avoiding it entirely does not provide a balance for our bodies that have depended on sunshine for their life. I think every person is individual and each body needs and tolerates the sun differently so the point of my vlog today is learn what your body needs. 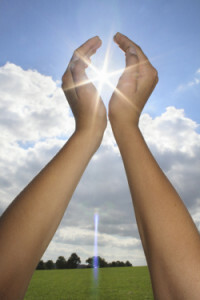 Get a Vitamin D test and understand what skin type you have so you can find harmony with the sun in your life. I say I didn’t QUIT Paleo or the Challenge just adjusted. Is that like saying I bought a pair of shoes because they are on sale? Hmmm…. I extended out my crossfit challenge and updated my run training into August and kicking off race season. I am running Rock and Roll Chicago on August 14th and I am hoping to take 10 minutes off my time!! (WHOA did I just put that in print???) I am excited as I learned some AWESOME things at Fitbloggin from Holly Perkins. I am ready to devour some information on HIIT and Interval training and how that relates to cortisol in your body. So much new news on some fun things I saw at the conference that are must have so I will share on that later in the week!! 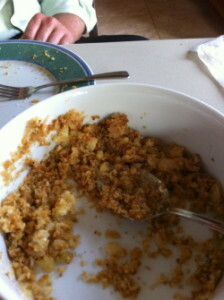 I have been a cooking fool this week as I got through the sugar headaches and am HUNGRY. 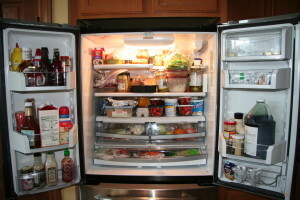 I feel like all I did this week was eat as I was looking to find things to fit cravings without jumping off the ledge. I talk in my vlog about the cookie and bars I made. The only down side is all treats start with a nut base so it’s hard to get a different flavor. I am going to try a hint of vanilla extract on my next ones or add dried fruit. I must say the winner of the week was turning cauliflower into something more tasty. I made a rice out of it with garlic, onion, and celery. I shot this vlog last night and you can see – by the end of this week I was wondering how am I happy on this diet. All the blogs I read that are paleo are lifestyle blogs where the person is not “dieting” they just live paleo. That is the thing I am missing. Every positive change that I have kept has always been a lifestyle change, not a diet. So last night I ate a tortilla and beans. CRAZY I know. I was so happy that I furthered my binge to ice cream with a little chocolate syrup. BLAH!!! Sickness. I felt miserable. I was burping and felt like my stomach was going to blow up. 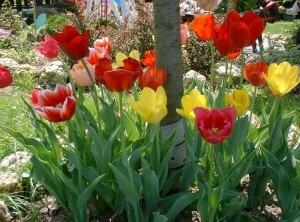 I went to bed and was feeling rather reflective on what is the happy medium for me? 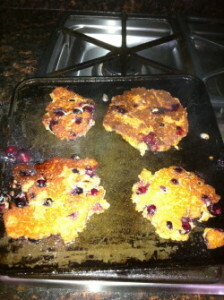 So this morning, I made these paleo pancakes from Everyday Paleo. I couldn’t believe it but they even got the kid approval! They aren’t sweet again but the blueberries with the almond meal base made me think of like a cobbler taste/feel. A gift that those 10 days have brought me is learning what my body likes and doesn’t. So over the next week, I am going to listen to my body a little more and stop feeling so restricted and when I want something take a few bites and leave it. I think alot of the paleo elements will fit into my lifestyle but I am ready to choose for them to be there. So this morning, I chose not to have sugar in my coffee and for some reason… it tasted so much sweeter…..
Maybe it’s back to the basics of just reducing junk while creating good habits? For every craving… say ok to one and no to the other and build a foundation for a lifestyle. What a great way to end the first year of running with my son at the finish line asking if he could see my medal and saying he was proud I ran that long. I think the biggest thing that I realized after having another 13.1 in the books had nothing to do with my finish time or being in shape…. It had to do with being an example of possibility to him. He mentioned watching the youngest runner of the half (12) cross the finish line “well before you mom so maybe I can beat you someday”. Today I am working on putting myself back together again with a massage and chiro adjustment and plenty of sleep! I went to bed at 9pm last night and finally feel like I can bend my knees again. (Note to self: start taking my fish oils again for joints) I took the day off activity but am trying to walk quite a bit today because I am getting stiff when I sit in front of the computer too long. Today also marks a big day – Day 1 of the Paleo Challenge! My goal is to give a try. I am nervous, scared and kinda just feeling lazy at the work I think it is going to take to go Paleo for 6 weeks. FUNNY but that is exactly how I felt a year ago when I tried to run my first mile and realized I was going to need to do 13 in August 😉 Yeah sure I would love to see if I actually have some abs under my beer layer but I think the bigger reason I am doing the challenge is to have focus. I am the type that loves the competition or end date of an event. I have been threatening to learn push ups since Raechelle was killing 50 at a time. Meanwhile, I think I am 7 and stuck there. You get what you focus on so I am on my way to 100 (even if they are assisted!) I think push ups are empowering as a woman and they make me feel strong. In the scheme of things, 6 weeks isn’t long and per my vlog, I will never know if I don’t try if I can do the diet or the push ups…..
OH MY – finally an amazing weekend in Chicago where we could be OUTSIDE!! I was suppose to be doing a to do list in the house but I couldn’t miss the weather or opportunity to train for the Great Western Half next weekend. So fun night in the city was followed by 8.5 miles! I have really been feeling the miles in my arch still so I have been using the golfball alot during the day to stretch the feet. 1. New clothing treat for this 13.1 😉 by a new fun brand Lole which is so amazingly soft! What to do you think of 6 wks of accountability?? Gotta decide by Saturday YEE HAW! 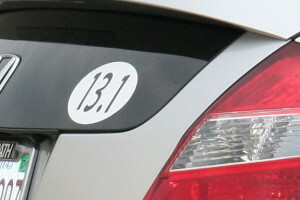 Look at the back of my car peeps – Yep I am officially a runner. I have the sticker and a Garmin now. WOO HOO! Also gave a solid update on the running. Conclusion in a nutshell = KETTLEBELLS rock! I have not gotten in the miles I wanted to again but the kettlebell work I am doing has made all the difference in me being ready in 2 weeks for another 13.1 miles!